Constantine I, his laureate head right, with parallel laurel ties. Sol in right hand and cornucopiae in left. Star in left field ΓI in right field, ANT in Exergue. The image below was photographed by Beast Coins. The image above is my own scan. Minted at the 13th officina (ΓI) in Antioch (Antakya, Turkey) 312 A.D.
Sutherland, C.H.V., "Roman Imperial Coinage", Vol. 6 (RIC), Antioch, p643, nr 164c (Unattested officina ΓI). hinterlassenen Sammlung und Aufzeichnung des Herrn Paul Gerin" (Voetter-Gerin), Antiochia, Constantine Magnus, p47, #15. Sear, D.R., "Roman Coins and their Values" (RCV Millennium Edition), Vol. 4, p449, nr. 15903. 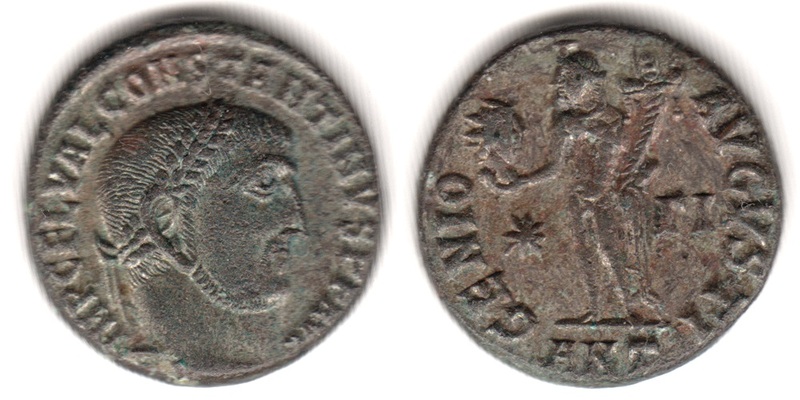 Failmezger, V., "Roman Bronze Coins From Paganism To Christianity 294-364 A.D." (Failmezger), nr 190pCI. Ex Voz Collection of Roman Imperial Tetrarchy. Vozmozhno's site www.tetrachy.com is no longer online but Beast Coins still has some of his coins (including this one) listed here. This coin is also featured on Not in RIC.